Indian price for imported items. Isn't it possible to regulate the price of imported items in india. There are lots of excuses for those online sellers (Tax, Custom duty, Shipping charge) and those are true for example: our custom are d*** & j*** sometimes that most of the senior members or those who tried to import something big would know & pyramid air charge heavily for shipping unless you order for more than 150usd. But there are some sites like Dhgate, gear best, aliexpress, alibaba. Maybe some sound weird but they ship some items with no shipping or with some little money for ship. 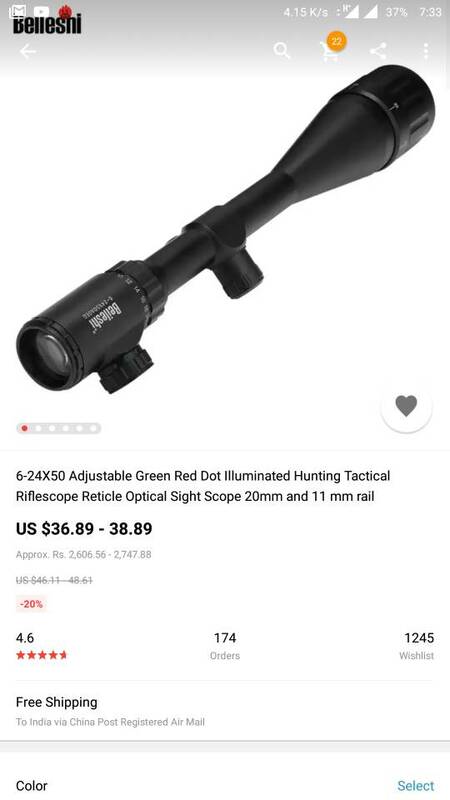 For example the base rail is sold for 213/- free shipping but our country its been listed for 500/- to 550/-, and the beileshi scope 2606-2747 but in indian sites its 6-7k. And the camo tapes are sold as 57.94/- but in india its 180 to 250/-. As a hobbyist I hate those pricing... I wish I could change it. And lastly for the air rifle that cost around 15k cost more than 50k in india, those are insane. The one site that listed those imported items in bit considerable price are all out of stock:- https://airgunindia.com/shoponline/ bad luch for every shooting hobbyist. Not much or big, but atleast it may help some newcomer. Last edited by Bullo oka on Sat Jun 16, 2018 7:50 pm, edited 1 time in total.